As I prepare to set off to Radauti with three of my cousins, I’ve come across this new (well, old) photo of Ettel Gruber, my great-grandmother, who is buried in the Jewish cemetery in Radauti, with a tombstone marked by candlesticks. The picture is believed to be of Ettel and two of her granddaughters, taken in Radauti, taken in 1936, when she was already in her 80s. I’m in Budapest this weekend, getting ready to head off to Radauti on Sept. 1 to carry out the photographic documentation for this (Candle)sticks on Stone project. I won’t be going alone, as I had thought — three of my cousins are coming with me: Arthur, and Hugh and his son Asher. (I hope we all fit in the car!) So it will be a combination art trip and roots trip, with some family gossip and tourism thrown in. 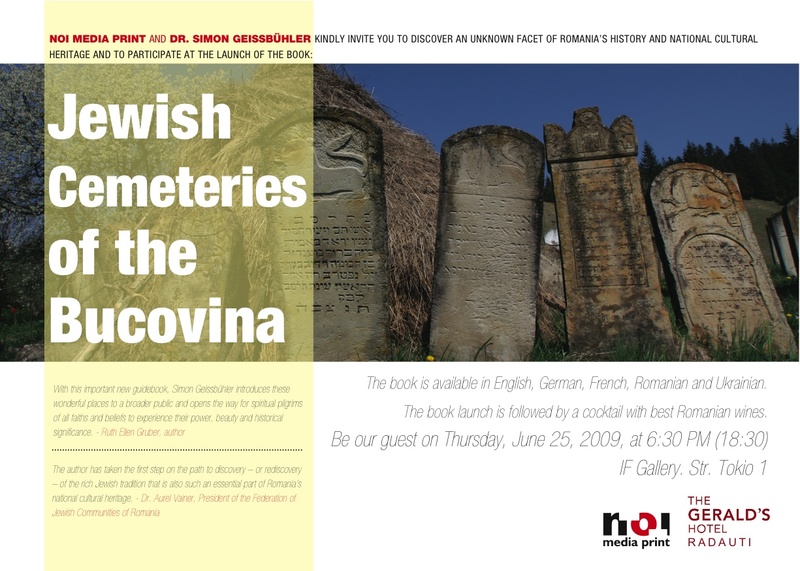 In addition, as part of the trip — and also as part of the annual European Day of Jewish Culture — next weekend I’m to take part in two presentations of a new guidebook on Jewish cemeteries in the Bucovina region (now divided between Romania and Ukraine), written by a Swiss diplomat based in Bucharest, Simon Geissbuehler. One presentation is i Radauti, and the other, on Sunday, is in Chernivtsi — Czernowitz — Ukraine, just over the border. A hand reaches out, grasps the branch of a tree and breaks it sharply off. The image is extraordinary, even surreal; so vivid that you can almost hear the crack of the wood. The tree is the Tree of Life and the hand is the hand of God — or maybe that of the Angel of Death. The portrayal, found repeated over and over in the Jewish cemetery in Radauti, in the Bucovina region of northern Romania, is one of the remarkable sculpted images found on Jewish tombstones in scores of Jewish cemeteries scattered over this part of East-Central Europe. I first visited Radauti more than 30 years ago, in the bitterly cold December of 1978. It is the town from which my grandparents emigrated to the United States, and it is here, in the Jewish cemetery, that my great-grandmother Ettel Gruber lies buried. Jewish cemeteries are often described as “Houses of the Living,” and, even when overgrown and abandoned, lives and life stories endure here in sculpted form. Jewish tombstone decoration combines religious and folk motifs that in many cases refer to the name, lineage, profession or personal attributes of the deceased. Numerous gravestones bear symbols referring to death, such as broken candles and broken flowers as well as the hand of God breaking the branch from a tree. But many more refer to life. Among the more common carved symbols are two hands in the spread-fingered gesture of priestly blessing on the gravestones of a Cohen (priest), that is, a descendant of the biblical High Priest Aaron. Another common symbol is a pitcher, or ewer, marking tombs of Levites, or descendants of the ancient tribe of Levi, priestly assistants who traditionally washed the hands of the priests. Books mark the graves of particularly learned people; hands placing coins into charity boxes denote those who were particularly generous. Candlesticks — as on my great-grandmother’s gravestone — often mark the tombstones of women, since in Jewish ritual women bless the candles on the Sabbath. The candlesticks are sometimes simple representations; others show ornate, almost braided candelabras, and some carvings include hands blessing the flames. The images of a variety of animals also frequently decorate the stones. Lions may symbolize the tribe of Judah or personal names, such as Lev or Leib. Carved stags indicate names such as Zvi or Hirsch. Birds often appear, and mythical beasts, such as the winged griffin, are also common. There is often, too, a wealth of other decorative carving such as flowers, vines, grapes, and geometric forms. All this imagery, and more, is found in the Jewish cemeteries of the Bucovina region. The decorated tombstones here, in fact, represent especially striking and sometimes startling examples of artistry, design and virtuoso stone-carving. Baroque tombstones from the 18th and 19th centuries in particular employ a richness of texture and imagery that approaches that found in the rococo decoration in some churches. In some places carving styles are so distinctive that you can discern the work of individual, now anonymous, artists. Few Jews live in the Bucovina today; the cemeteries thus form powerful memorials to a civilization that was wiped out in the Holocaust. Moreover, the liveliness and fantasy employed by the stone-masons adds a new dimension to how we may regard the spiritual, intellectual and artistic lives of Jews who lived in traditional East European shtetls. To me, these elaborate sculpted gravestones are just as important manifestations of faith through art as are the marvelous painted monasteries that are also found in this region. Yet few people know of their existence, and even fewer ever visit. With this important new guidebook, Simon Geissbühler introduces these wonderful places to a broader public and opens the way for spiritual pilgrims of all faiths and beliefs to experience their power, beauty and historical significance. According to my cousin Sandy Gruber, the daughter of my father’s younger brother Matthew (z”l), her mother lit the candlesticks on Friday night during Sandy’s childhood. Sandy grew up as one of seven children in the little town of Toledo, Oregon, where my uncle was a doctor. As I recall, they were the only Jewish family in town. Each of the three boys was sent back east, to Akron, OH, when he was about 12 to live with Aunt Alice’s family and prepare for his bar mitzvah. Those bar mitzvahs became major family occasions — we would pile in the car drive out to Akron from Philadelphia for the events. I light the Hannukah candles and we hold a Seder each year that most everyone comes to. I think that is mostly to get with family than it is to celebrate Passover (but also to honor a tradition that Mom and Dad thought important) . I do like the telling of the Exodus story. I am not observant, but I do identify myself as a Jew, especially when I am in a Christian setting such as a church or Christmas celebration. I do feel Jewish, but I have never been one for the trappings of religion. I do not wear a yarmulke or pray or even think of anything as being designed by a higher power. I do believe in doing good things and that is most important.